Agora Books is thrilled to announce that The Essential George Bellairs Box Set by George Bellairs is out now! The Essential George Bellairs Box Set is required reading for fans of this classic crime great. The Essential George Bellairs Box Set is available to buy HERE. Let us introduce you to Inspector Thomas Littlejohn in this essential collection of Bellairs mysteries. Get acquainted with his sharp tongue and dry sense of humour, and travel from small English villages to the scenic Isle of Man and French Provinces. Filled with red-herrings and comic wit, these rediscovered classics are the epitome of Traditional British crime. 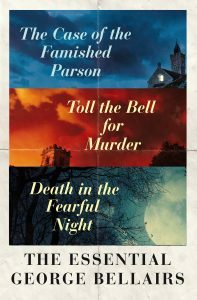 This box set includes The Case of the Famished Parson, Toll the Bell for Murder, and Death in the Fearful Night.